My daughter has a school dance this Friday and the theme is “Winter”. She’s not real big on dressing up much, so I offered to make her a snowflake pin. The inspiration for the pins was from 100 Snowflakes to Crochet by Caitlin Sainio. 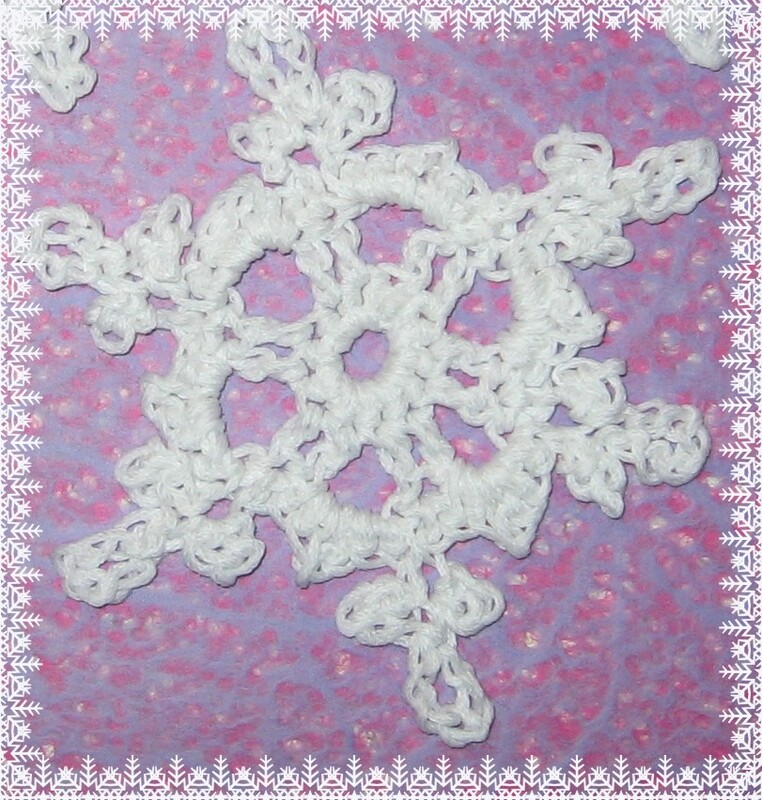 This book has beautiful photos, patterns, charts for an amazing variety of crochet snowflakes. 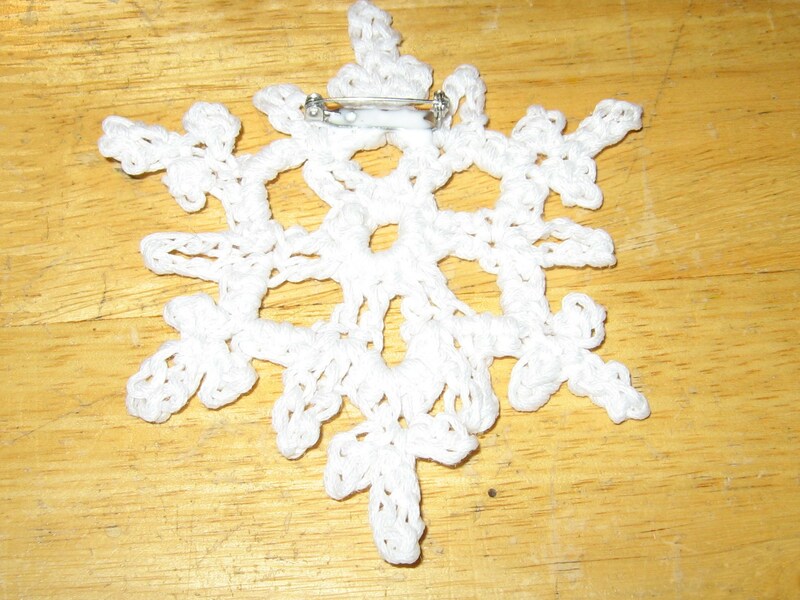 And it’s a great way to get started on designing your own crochet snowflakes. I used a white cotton yarn—Tahki cotton to be exact, but any cotton yarn will work. 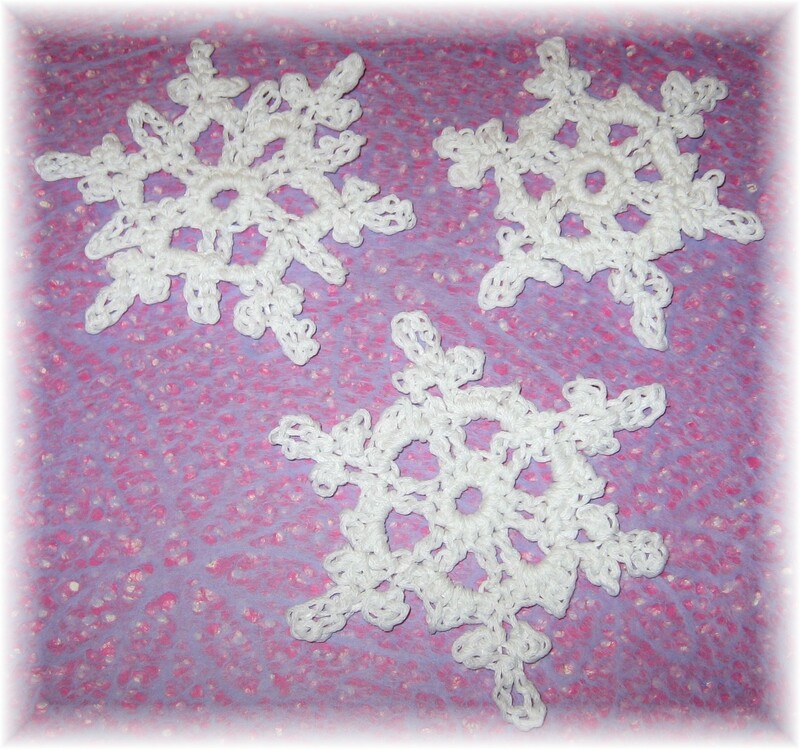 After I crocheted the snowflakes, I needed to stiffen them. You can buy fabric stiffener, but I made a mixture of 1 part Tacky Glue to 1 part water. I made sure the snowflakes was thoroughly saturated and then gently wrung out the excess and flattened out the snowflake on a piece of wax paper and let dry for about 24 hours. You can pin the snowflake into shape if you want. You can see in the photo that I did this with one of them. I just put a piece of cardboard underneath the wax paper and pinned into that. When the snowflakes are completely dry, you can sew the pin backing on. I just used standard white sewing thread. After sewing, I also added some Tacky Glue for extra security. Voila! Round 1: Ch 1, 12 sc in ring, join with slip stitch to beginning ch-1. Round 2: Ch 3 (counts as dc), dc in next sc, ch 3,*dc in next 2 sc, ch 3; repeat from * around , join with a slip stitch to first sc. Round 3: Ch 1 (counts as sc), *ch 5 and slip stitch in 4th ch from hook , ch 6 and slip stitch in 6th chain from hook, ch 5 and slip stitch in 5th ch from hook, slip stitch in 1st ch of the ch-5, sc in next dc, (2 sc, ch 6, 2 sc in ch-3 space, sc in next dc; repeat from * around, join with slip stitch to beginning ch-1. Fasten off.